Sun-rain-snow-sleet and this gorgeous heather. Lovely heaths and heathers....so colourful. Wow this is fantastic Catfinch! 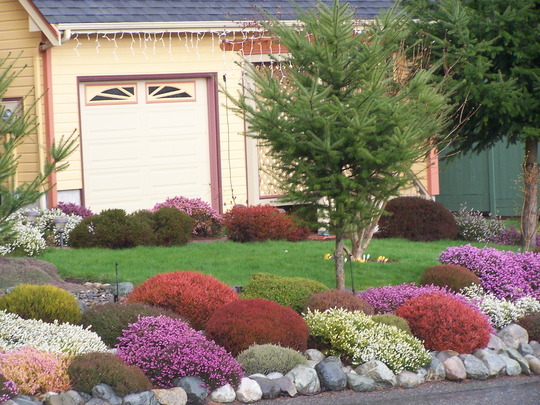 These people always have an immaculate garden and lawn...I love the colors of the house and the shrubbery... all around it, it is like this..but this is the side I was driving on today..lol..if I drive by on the other side one day.I will try to get a shot too..lol.. I am going to have to go and knock on their door and ask what they do to make it grow like this...everytime I have tried to grow it is dies...does it need a sweet soil I wonder? That depends on what sort of heather it is - some have to have acid soil, while others can grow in alkaline. I have never seen such a display of heather. LOL..I will let GOY know I promise..if I get up the courage to do it! They really have done a great job with it haven't they Deida.. So many colours simply stunning! What a beautiful garden. I just started my garden. Can anybody advise what kinds of plants grew in this garden? Thank you!! Hours and hours of planning, knowledge, and attention; what a success! Wish I could do that!. This photo is of species Heather.